The 1987 Canada Cup featured some of the most formidable national squads in international hockey history. 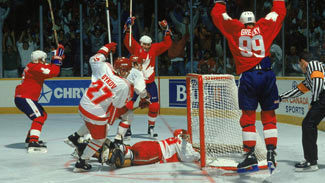 The Canadian team alone featured 12 eventual Hall of Famers and cut three others: Patrick Roy, Steve Yzerman and Cam Neely. 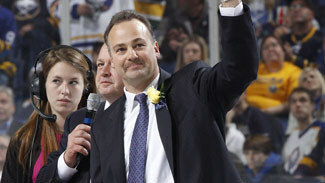 Dale Hawerchuk: The longtime Jets and Sabres star was named player of the game in the tournament's deciding contest. The Hall of Famer has served as coach and director of hockey operations for the Barrie Colts of the Ontario Hockey League since 2010. Michel Goulet: The Hall of Fame wing had an illustrious career with Quebec and Chicago before becoming Colorado's director of player personnel following his retirement. He currently is Calgary's western pro scout. Brian Propp: The smallish wing registered more than 1,000 points in his playing career before unsuccessfully running for a seat in the New Jersey General Assembly in 2007. He currently is the vice president of strategic account management for the Judge Group, a professional services firm based in Pennsylvania. Craig Hartsburg: A stalwart on defense for 10 seasons for the Minnesota North Stars, Hartsburg has been a prominent coach throughout hockey. He was coach of the Blackhawks, Ducks and Senators before taking over the Sault Ste. Marie Greyhounds of the OHL and Everett Silvertips of the WHL. He currently works as an assistant coach with the Columbus Blue Jackets. James Patrick: Following a successful collegiate career at North Dakota, Patrick enjoyed a productive 21-year NHL career. After playing his last six seasons in Buffalo, the team named him an assistant coach upon his retirement. He is entering his seventh season behind the Sabres bench. Ron Hextall: A backup to Grant Fuhr for much of the Canada Cup, Hextall won the Vezina and Conn Smythe trophies in the weeks preceding the tournament. Following a productive NHL career, Hextall joined the Flyers' scouting staff in 1999, eventually becoming the assistant general manager in Los Angeles, where he won the Stanley Cup this past season. Dominik Hasek: After starting out with the Czechoslovakian national team, Hasek enjoyed one of the most impressive NHL careers in recent memory, winning six Vezina trophies, two Hart trophies, Olympic gold, and two Stanley Cups. Since leaving the NHL in 2008, he has played sparingly in European leagues and was rumored to be considering an NHL comeback as recently as May. David Volek: A young star who eventually defected to play for the New York Islanders, Volek played six NHL seasons before finishing his career with his hometown club in Prague. He since has worked as a scout and coach for the club. Miroslav Horava: A prominent international player who played parts of three seasons with the Rangers, Horava has worked as a coach with a number of clubs in the Czech Extraliga. He most recently served as coach of Sweden's legendary Modo club, where he also played for three seasons. Jiri Hrdina: A winner of three Stanley Cups, Hrdina was almost 30 when he left Czechoslovakia to play for the Calgary Flames. He currently works as an amateur scout for the Dallas Stars. Vladimir Ruzicka: A high-scoring forward who won gold with the Czech Republic at the 1998 Winter Olympics, Ruzicka spent parts of five seasons in the NHL. After finishing his playing career with Slavia Praha, Ruzicka coached the team for five years before taking over the Czech national team. Kari Takko: A fixture of Finnish hockey, the goaltender played six NHL seasons, primarily with the Minnesota North Stars. He currently is the Dallas Stars' lead European scout. Christian Ruuttu: The center played 10 seasons in the NHL before becoming Phoenix's director of European scouting. He currently works as a European scout for the Kings; his son, Alexander, was drafted by the Coyotes in 2011. Raimo Helminen: Known as "the Maestro" in his native Finland, Helminen's six Winter Olympic appearances remain an all-time record. The center played 117 NHL games, but is a fixture in the Finnish leagues, where he most recently played for Ilves in 2008 at age 44. Since retiring, he has worked as an assistant coach for the club. Jari Kurri: A five-time Stanley Cup winner and Hall of Famer, Kurri scored 601 goals in his NHL career while being a central figure for his national team. Since retiring, Kurri has served as general manager of the Finnish national team, which won the 2011 World Championship. Petri Skriko: A young star as a player in Finland, Skriko scored an impressive 154 goals in his first five NHL seasons with Vancouver. 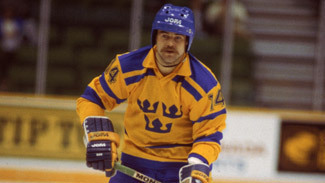 He finished his playing career in Denmark and serves as a European scout for the Capitals. Esa Tikkanen: A five-time Stanley Cup winner, including four alongside countryman Kurri, Tikkanen returned to Finland to close out his playing career. He has been coach of Jokipojat, a Finnish semi-pro team, since 2010. Kent Nilsson: The high-scoring center was a star for Calgary before winning a Stanley Cup with Edmonton in 1987. Nilsson was inducted into the IIHF Hall of Fame in 2006 and currently works as the Florida Panthers' international pro scout. Tommy Albelin: The defenseman played 13 of his 19 NHL seasons in New Jersey, which hired him as an assistant coach following his 2007 retirement. He currently works as an assistant coach for the team's AHL club in Albany. Anders Eldebrink: A star player in Europe for several years, Eldebrink became a manager with his hometown club in Sodertalje. Most recently, he served as coach for the Swiss League's Kloten Flyers. Bengt-Ake Gustafsson: Since playing nine seasons with the Washington Capitals, Gustafsson has coached numerous teams in four countries. He was formerly coach of the Swiss and Swedish national teams, leading the latter to gold at the 2006 Olympics, and was most recently coach of Atlant Moscow Oblast, becoming the first Swede to be a KHL head coach. Viacheslav Bykov: A fixture on the dominant Soviet teams of the '80s, Bykov was a ninth-round draft pick of the Nordiques but never played in the NHL. The four-time world champion was named the Russian national team coach in 2006, leading the squad to back-to-back World Championships in 2008 and 2009. Viacheslav Fetisov: Generally regarded as among the greatest athletes in Russian history, the national team captain won two Olympic golds, two Stanley Cups, and every honor his home country has been known to offer. After briefly serving as an assistant coach with the Devils, Fetisov became a member of Russia's federal assembly, chairman of the board of directors of the World Anti-Doping Agency, as well as club president of CSKA Moscow of the KHL. Alexei Kasatonov: Fetisov's longtime defensive partner, Kasatonov played seven NHL seasons before eventually returning to Russia to serve as vice president of CSKA. He currently is the general manager of SKA St. Petersburg of the KHL. Igor Kravchuk: The lone defenseman back on the 3-on-1 that led to Mario Lemieux's series-winning goal, Kravchuk was a rising young star on a national team that won consecutive Olympic tournaments in 1988 and 1992. Kravchuk played parts of 12 seasons in the NHL before becoming the coach at Harrington College in Oka, Que. Last year he was hired by the Russian national team as a North American scout. Igor Larionov: Another highly decorated national-team player, Larionov was a dominating center who played 14 NHL seasons and won back-to-back Stanley Cups in Detroit alongside Fetisov. He currently serves as an agent, representing among others Nail Yakupov and Alex Galchenyuk, the first and third players selected, respectively, at the 2012 NHL Draft. Sergei Nemchinov: One of the first Russian players to have his name etched on the Stanley Cup, the center played 11 NHL seasons. A former coach of Russia's national team, Nemchinov is the general manager of CSKA Moscow of the KHL. Tom Barrasso: The 1984 Calder and Vezina Trophy winner won consecutive Stanley Cups with Pittsburgh and an Olympic silver medal in 2002. After serving as an assistant coach with Carolina for four years, the U.S. Hockey Hall of Famer was hired as an assistant with Metallurg Magnitogorsk of the KHL. Joe Mullen: A three-time Cup winner and Hockey Hall of Famer, Mullen retired as the all-time goals leader among U.S.-born players. Since 2007, he has served as an assistant coach with the Philadelphia Flyers. Pat LaFontaine: The third pick in the 1983 Entry Draft scored a remarkable 1,013 points in 865 games. Since retiring in 1998, LaFontaine has coached youth hockey in Kings Park, Long Island, N.Y., and founded the Companions in Courage Foundation, a charity that builds interactive playrooms in children's hospitals. Joel Otto:Despite being passed over in the draft, Otto played 14 seasons in the NHL, winning the Stanley Cup with Calgary in 1989. Since retiring in 1998, Otto has worked with the University of Calgary hockey program and is an assistant coach with the Calgary Hitmen of the WHL. Phil Housley: One of the highest-scoring American-born players in NHL history, Housley played 21 seasons, earning seven All-Star game appearances and a silver medal at the 2002 Olympics. 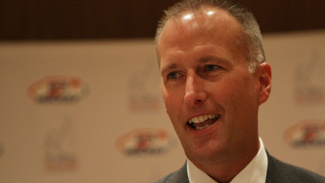 He coaches high school hockey in Minnesota and this winter will coach the U.S. at the 2013 World Junior Championship.